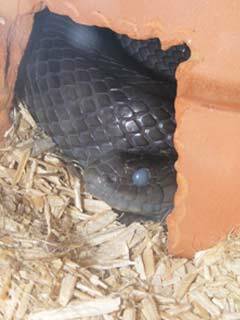 Colouring: King snakes come in every colour imaginable, which is why they have become popular has pets. Breeders have also developed many new varieties of colours, so trying to describe a common colouring for a kingsnake has become even more difficult. The colour variation between the different sub-species of common king snakes are so diverse that they can be either vibrant colours like the bright yellow on black of California Kingsnakes or be simply pure plain black like the Mexican Black. Either colour variation can be equally striking, that is why kingsnakes have such a great appeal. Size: Common Kingsnakes are the largest of the kingsnakes and can grow up to 6 ft in Length, with the average being about 4ft. Origin: Most of the common King Snakes are native to North America, but some are also found in South America too. 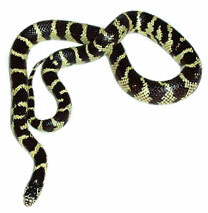 Habitat: Common Kingsnakes are usually found in mountain regions, desert savannahs and occasionally in sparsely forested woodlands. The climate in their native homeland is quite dry, so they prefer low humidity levels in their habitat. Many of the common kingsnakes are normally diurnal (active by day), but when summer temperatures are high they often become more active by night to avoid the heat of the sun. Hatchling kingsnakes tend to be a bit feisty, but will soon tame down with regular handling. They are likely to musk or bite when cornered, but this is a defensive tactic that will cease when the snake becomes more comfortable with your presence. King snake bites rarely hurt and should not deter you from keeping a kingsnake as a pet. King Snakes in the wild will eat a very varied diet of rodents, birds, amphibians and other reptiles (including other snakes), but King Snakes in captivity can be fed entirely on mice or rats and still be healthy. The rodent should be of a appropriate size in comparison to the size of their mouth and be large enough to leave a bump in your King Snakes body once ingested. King Snakes are cold blooded and get heat from their surroundings. In the wild snakes bask in the sun to keep warm or move to a shady spot if they are too hot, this is called thermo-regulation. 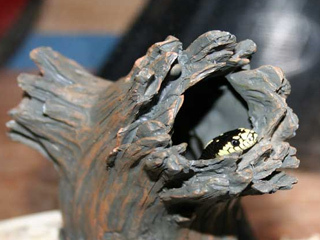 The ideal temperature for the hot area of your snake's vivarium is around 27-33°C (81-91°F). King snakes do not need to maintain a set humidity level, but some appreciate a light misting of their vivarium occasionally. 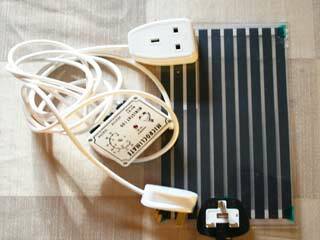 This is especially useful to raise the humidity during the shedding process.